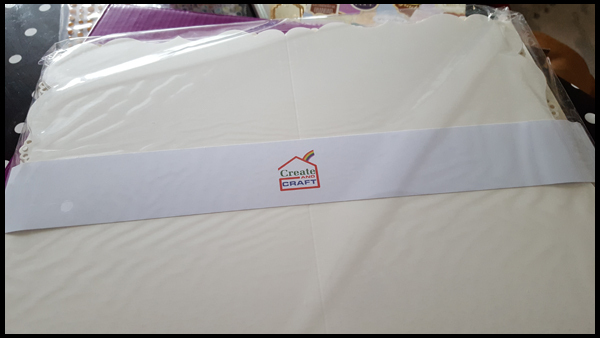 When I was recently asked if I would like to try out some cardmaking materials courtesy of Create and Craft, my initial reaction was to say no! I've never created cards before, they look so beautiful and complicated I was worried that I'd be showing you all some beautiful card blanks and how to mess them up royally. 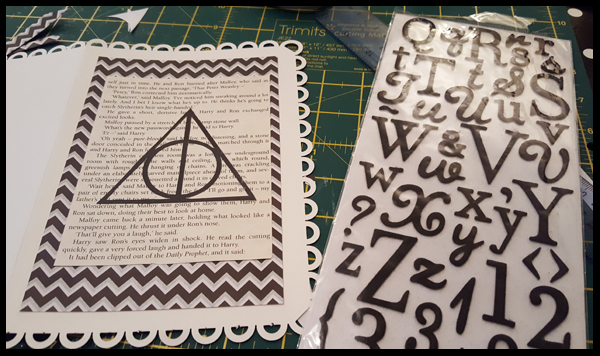 So I left it for a day or so and had a look on Pinterest but nothing was popping out to me, I had a look through my craft magazine and also the Papercraft Hints and Tips, and then I saw my Deathly Hallows image on the cover of my laptop and knew then that I wanted to give this a shot! 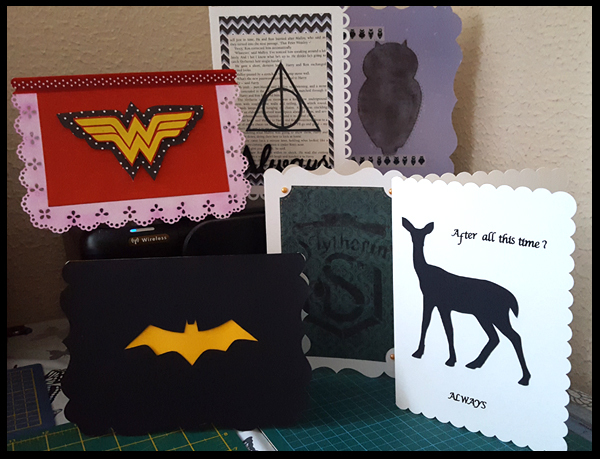 As you can see the card blanks and envelopes are courtesy of Create and Craft, and I've used each of the patterned cards to create Harry Potter and superhero inspired cards. All the cards I've made are simple to make, cut by hand, no card dies are used so it's a bit time consuming but very satisfying! 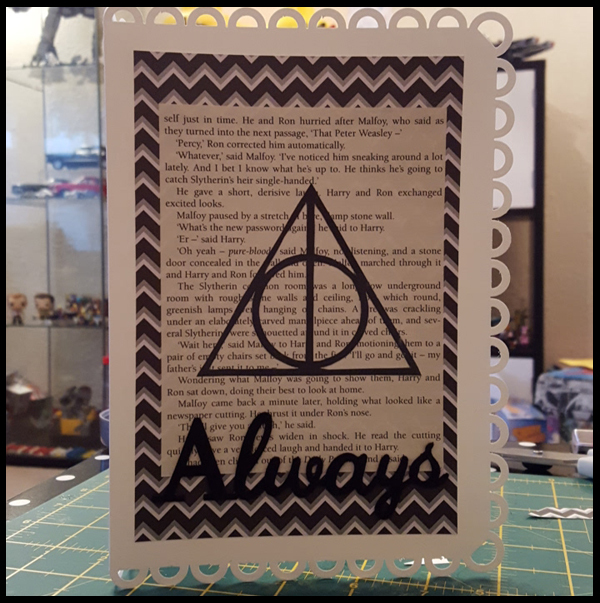 The first of which was my beloved Deathly Hallows card. 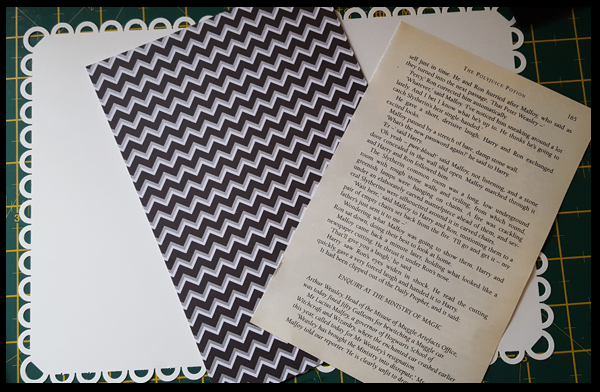 I have a few copies of Harry Potter in my craft room for this very reason, these have all been picked up from charity shops as I'd never dream of cutting my originals! Once I'd found a fitting page I then had a rummage in my paper stack for a suitable background. I've stuck with black and white for this card. 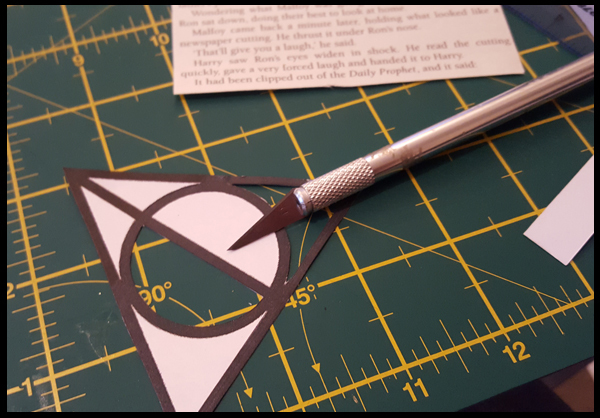 So I printed out a template of the Deathly Hallows and very carefully cut the image out and glued onto my page. 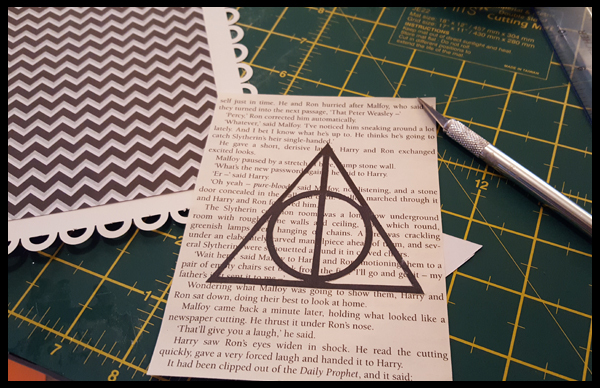 So that's my first ever card made thanks to my Create and Craft pack, but like I said, I found this rather addictive and after cutting out several owls and the Slytherin Crest I made a few more cards using an ink pad and a cotton wool ball! 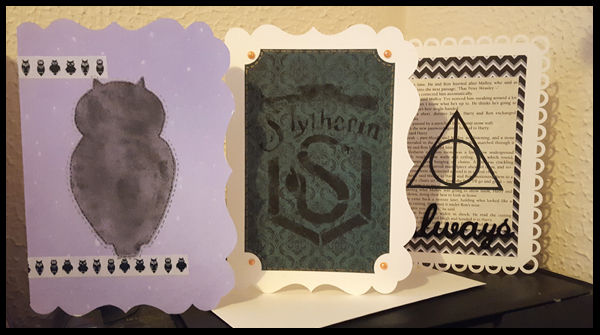 I could have created Harry Potter inspired cards all week if I'm honest. 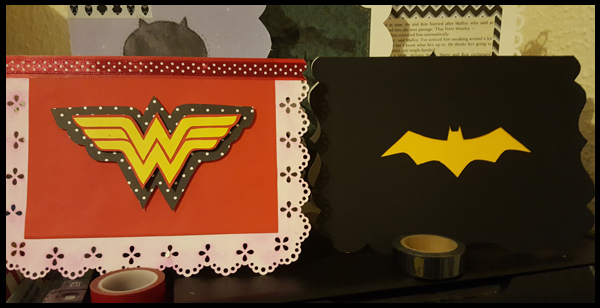 I absolutely loved creating these, but I also wanted to see if I could create a couple of superhero cards, I was mainly thinking for father's day... but ended up creating Wonder Woman first .... shhh! I rather love the Batman card and it was very much my favourite until I completed one last Potter card. 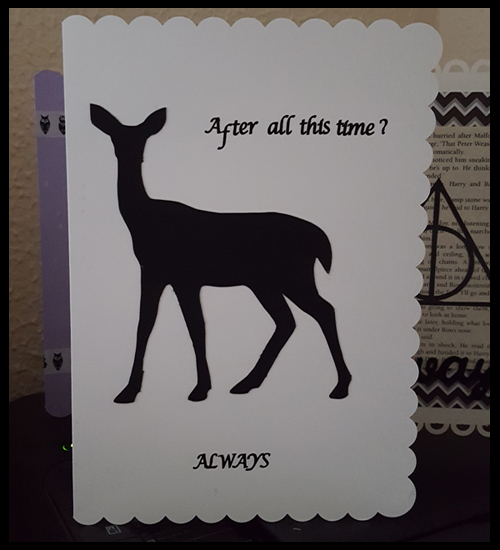 Again, this was just a doe template cut out and some lettering added, but it took me some time and I may keep this one up on the mantle. There we have it, my attempt at card making! I'm so pleased I tried now, and can't wait to create some more, I see why this is such a popular hobby! The only limitation is your imagination! I love that you've kept those from your mum, I may start making a few for special friends and family, but they are time consuming and you really need to set an evening a side to just chill out and make. Not always easy with little ones eh. wow - those cards look so professional! I always love homemade cards more than shop bought - so special.